This thirty year old military wife and mother from Virginia Beach consulted with me about breast surgery and also an abdominoplasty. She was unhappy with the shape and symmetry of her breasts. 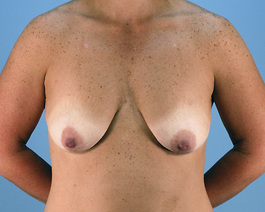 Upon exam, it was revealed that her left breast was larger and also lower than the right. She wanted to be more symmetric with less sag and more fullness at the top. After a thorough discussion, together we decided that her best result would be to perform a full breast lift with removal of some tissue and placing implants to give her the fullness she wanted. 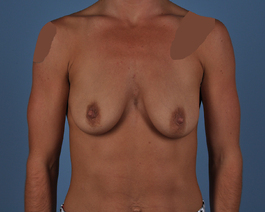 To make her more even, we removed more breast tissue on the left and also filled her right implant slightly more. You can see from the after photos that she looks more symmetric and she achieved the fullness she wanted at the top. Because she had a full lift, the safest way to perform her abdominoplasty was a separate surgery 3 days later. This Virginia Beach woman is thrilled with the results of her “Mommy Makeover” and the fact that her safety was our top priority.